CSS+FLASH Make a footer that stay on the bottom of the content. One of the problems that i have found when i made a web site that need a css footer, is that when the contents is smaller than the browser page i see all right, but when the contents is bigger than the browser i saw the footers position not at the end of the contents, but at the end of the browser page ( my screen ). i found a solutions by using css and an empty div. 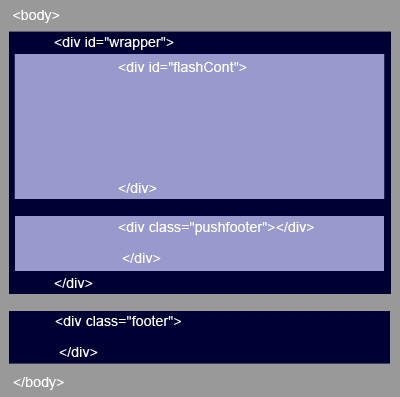 the <wrapper> div , is the one that contains all the contents ( except the footer ) in the <flashCont> div we put the flash content, the <pushfooter> is an empty div that is used for be sure that the footer stays to the bottom of the wrapper div.